What is the blue color, please??? Beautiful! Does anyone know where I can find this chandelier but in a polished nickel finish? Thank you! You may have luck on Circa Lighting or Hudson Valley Lighting. I usually see this style of chandelier in a darker or more antique finish, such as shown. If you happen to have changed your mind, this looks to be the Veranda Round Chandelier from Pottery Barn. Where do you go to find such a large Lazy Susan and in black lacquer? - I would like to find a large Lazy Susan. I am looking for a contemporary glass or even black lacquer like the one above. Must have a modern edge and style. Lovely grey color counter with the blue - what is it? This lovely built-in piece cleverly includes a serving window directly into the kitchen. 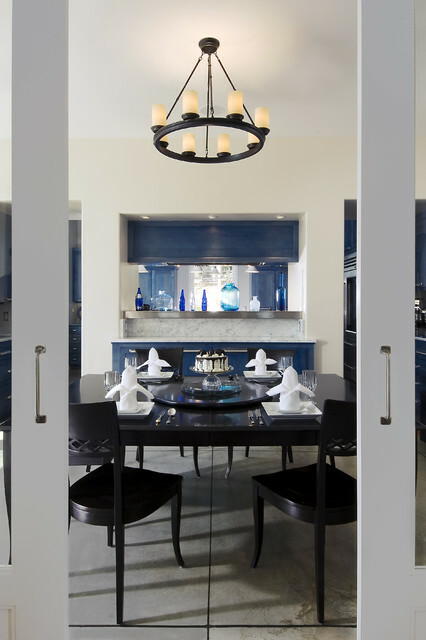 Not only does this pass-through connect the kitchen and dining area, but it also offers a glimpse of vibrant blue cabinetry that wakes up the neutral palette. The effect is almost like a piece of artwork in the center of a white frame.